Last time, I mentioned the fact that I’d been painting some Necron stuff again, after what felt like an enormous hiatus from the undead space robots. Well, I’ve spent the past week thinking about what to do with the army, and lots of plans have been drawn up and promptly cast aside. 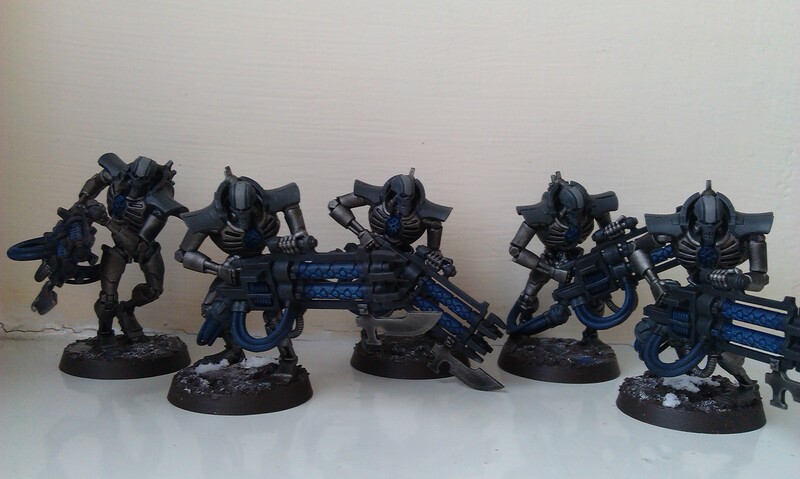 However, I think I’ve finally managed to get myself into a vague position where I’m feeling good about the force that I have drawn up, so thought I’d come here today and ramble a bit about my new Necron plans! 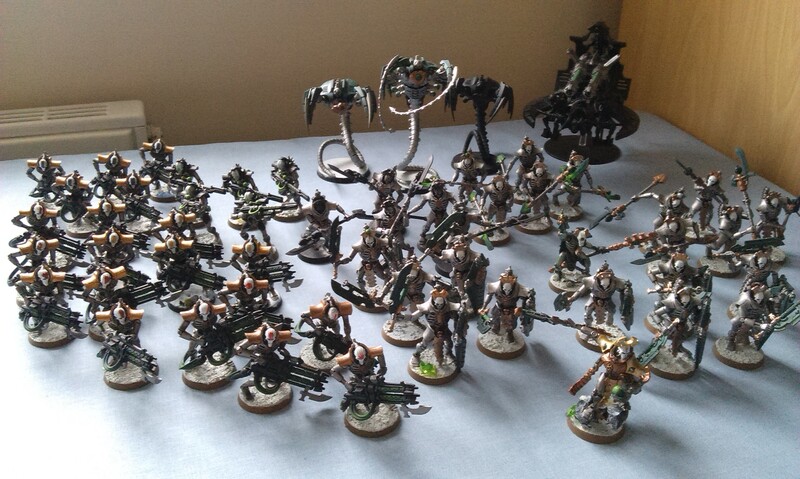 If you’ve been reading this blog for a while, you will likely know about my love of the Necrons as my very first 40k army from way back in the day. In fact, you can see most of the massed troops that I had painted up to this point in the picture above. Heavy on the infantry, with a lot of Lychguard, because I love the idea of the implacable robot tide. I particularly love the Lychguard kit for its beautiful space skeletons, the armour of those guys is so ornate… Ah, beautiful! Anyway, I’ve been painting Necrons in this silver-and-gold-and-green scheme for a very long time up to this point, and while I do enjoy it, I think I was beginning to tire of it somewhat. In the main, the fact that this was the colourscheme that I had come up with back when I was first getting into painting miniatures had begun to wear a little on me, as whenever I was adding more units to the army, I felt almost that I had to regress my painting to match the very earliest miniatures I’d painted. So last summer, I decided to repaint the entire Legion. Well, for that reason, and the fact that GW had discontinued Mourn Mountain Snow as a texture paint, so I was faced with the option of no more snow bases! I came up with my own take on the Thokt dynasty, and painted five Immortals before pretty much calling it a day with these guys for a long time. Moving house probably didn’t help, but I also had developed a love for Drukhari that meant I was focusing my efforts elsewhere instead. However, in the intervening months, I have managed to paint up five Lychguard with warscythes – because Lychguard are awesome, remember – and the new Cryptek from the Forgebane box, because that model just appealed to me like nothing from the recent batch of releases. And then, of course, I painted a Night Scythe last weekend! All of this has really helped me to get into the new colour scheme for the new army, which is primarily grey-blue rather than the black and blue of the scheme that had originally appealed to me so much from the back of the Immortals box. 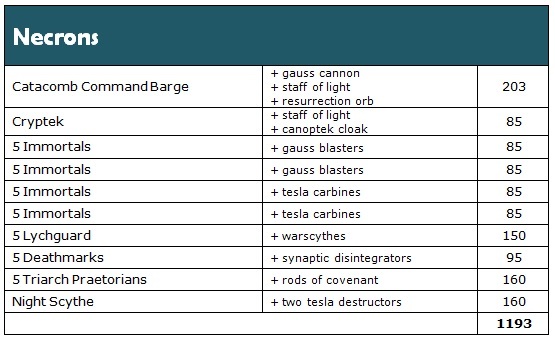 Well, I’ve taken stock of the current models that I have, including those in partial states of completion, and in an attempt to put aside my massive love for Lychguard, I’ve come up with a list that I feel is something that I would want to actually play. See, this has been a huge problem for me since the new Codex came out earlier this year. All of the models are so damned expensive, my playstyle of having a horde of undead robots doesn’t really lend itself to the new edition. Of course, I suppose 7th edition was hardly good in that respect, either. But I’ll be writing another blog later in the week about the Codex and my thoughts there, so stay tuned for that! The plan for this list is fairly straightforward, as regards playing it goes. The Immortals are a fire-support as the elite choices move across the board to where they need to be. The Lychguard will start on the Tomb World, and will be beamed to where they’re needed by the Night Sythe, while the Deathmarks will come in when they’re needed to plop down and (hopefully) do some serious work. Being a small, fairly elite army here, I do feel a little nervy about the Reanimation Protocols, so I’ll want the Cryptek to hang back and buff the Immortals where possible. I’ve costed up the majority of the models that I have on the go in varying stages of completion, and there are several things that I’d like to bring depending on the situation at hand. Foremost among them is the addition of Orikan the Diviner, the HQ model that I’ve used the most, and for some reason the one I enjoy the most, lore-wise. I’ve also been really keen to field the Doomsday Ark since I first bought the battalion box back in the day. I’ve had the Tesseract Ark built up for about three years at this point, so I want to try and get that built to see what it does, though I am always a little hesitant to use Forge World models due to the reputation they can have. 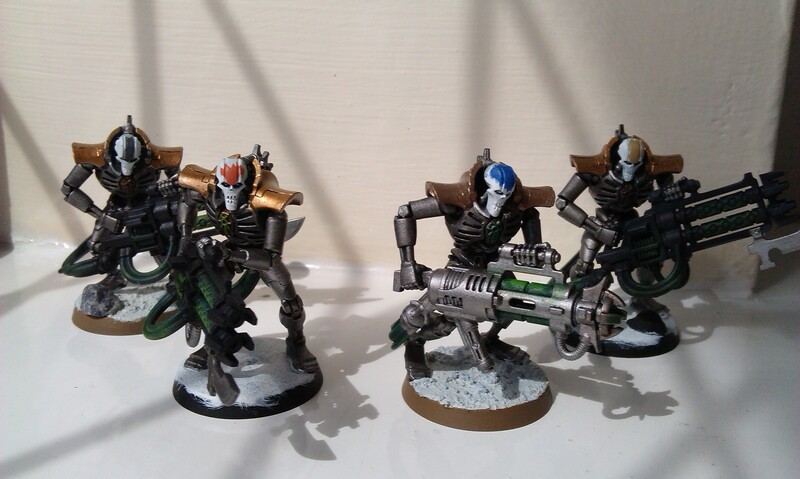 I’ve only played with my Necrons three times in 8th edition, so I’m no expert in this regard. I feel like having a small number of bodies might be a bad thing, but I suppose the facility to bring them back often (if the unit isn’t obliterated) should mitigate that somewhat. There’s a variety to the list that I enjoy, so I’m hoping that will help, as well. All in all, then, I’m excited to finally get the Necron force on the table. Time to get painting then, I guess!! Pingback: Bank Holiday Painting Extravaganza! Previous Previous post: Painting Weekend!